Big Lots Coupon: Save up to $100! Through 12/24/17 get $10 off your purchase of $50, $20 off $100, $40 off $200, or $100 off $500 your purchase at Big Lots! To use in store, print coupon or present barcode to cashier. 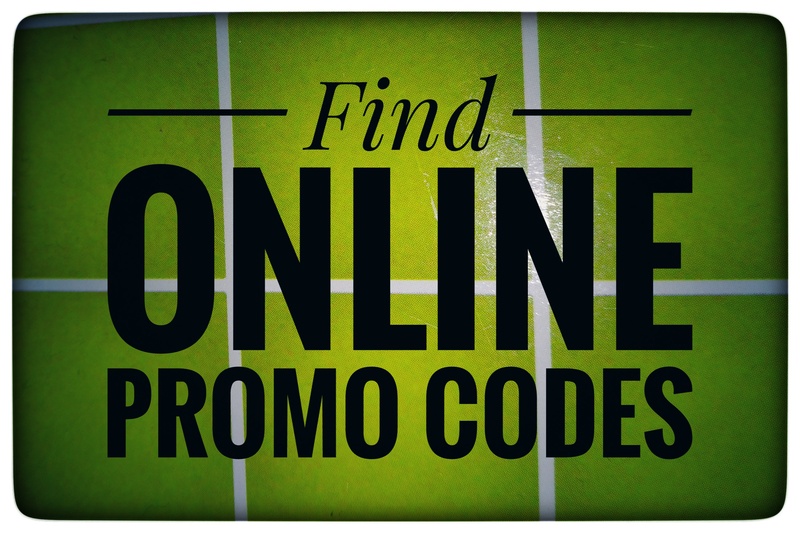 Enter code SHAREJOY at checkout to use online. **HOT** Essential Oil Diffuser – ONLY $9.99 w/Promo Code! *AMAZON PROMO CODE* Essential Oil Diffuser – ONLY $9.99! YAY! Grab one for yourself or a gift at only $9.99 after this HOT coupon! Simply add the Essential Oil Diffuser currently priced at $17.99 to your cart and enter promotional code YNNMNRGG at checkout to instantly drop the price to $9.99! Shipping is free for Prime Members or on qualifying orders over $25, but don’t wait long these codes tend to go quickly! Unique LED Light Mode: Enjoy every nuance of the 5 stunning LED colors that will breathe from light to dark for an extra soothing experience. You can double press the Light Button to experience amazing breathing light! Silent Operation: No annoying Beep sounds that will disrupt your yoga, meditation or nap sessions; For a quality sleeping at night, you can press for 1.5 seconds to turn off the lighting as well as the light of the buttons. ~TODAY ONLY~ Insignia 6 Quart Pressure Cooker – ONLY $39.99 (Reg: $100)! Head on over to Best Buy today only (12/21/17) or while supplies last and score the Insignia 6 Quart Pressure Cooker for only $39.99! This is regularly priced at $99.99 and shipping is FREE! Make meals for the whole family with this 6-quart Insignia electric pressure cooker. Eight preset buttons let you prepare a wide range of healthy meals, and the warming function ensures a perfect temperature once you’re ready to eat. This Insignia electric pressure cooker has a locking lid and temperature sensor for safety. 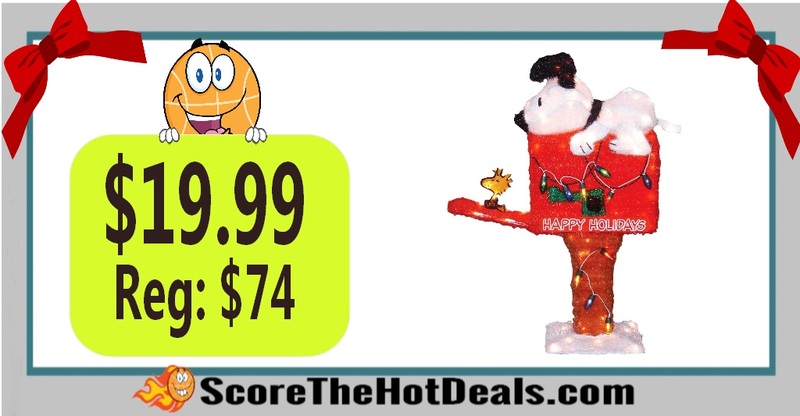 *RUN* 36-Inch Pre-Lit Peanuts Snoopy on the Mailbox Animated Christmas Yard Decoration – ONLY $19.99! *PRINT NOW* Score Purex Laundry Detergent – As Low As F.R.E.E!!!! WAHOO!!! Hurry on over and print this HOT coupon for $1.50 off any one Purex Liquid Laundry Detergent while it lasts! You can redeem it at any local store that accepts coupons, but if you’d like to score some for FREE check out our deal idea below! Receive $1.50 Extrabucks – What is an ExtraBuck? These are the incentives that CVS offers to get you to shop. They are basically like cash and can be used towards your purchases. Tot Tutors Focus Playtime Bookcase – ONLY $12.49! Hurry on over to ToysRUs while supplies last and score the Tot Tutors Focus Playtime Bookcase for only $12.49! This is regularly $24.98 and shipping is free on orders over $29 or you can opt for free in store pick up where available! The Tot Tutors Focus Playtime Bookcase has 2 shelves in a playful house shape to help make reading fun! This bookshelf is large enough to hold your child’s growing assortment of books, along with board games and toys. It even has space to display picture frames in your child’s bedroom, playroom, nursery or the living room. The open design makes it easy for boys and girls to identify and grab books and toys. This bookcase helps keep your little one’s room clean while at the same time promoting organization and encouraging reading. *Amazon Promo Code* Hair Straightening Brush – ONLY $13.99! Hurry on over to Amazon while supplies last and score a Hair Straightening brush for only $13.99 after this HOT coupon! Simply enter promotional code LDYUQID2 at checkout and you should see the price drop instantly from $29.99 down to $13.99 while this one is still valid! EXPIRED: Gourmia 2.2Qt Hot Air Fryer – ONLY $39.99 SHIPPED! 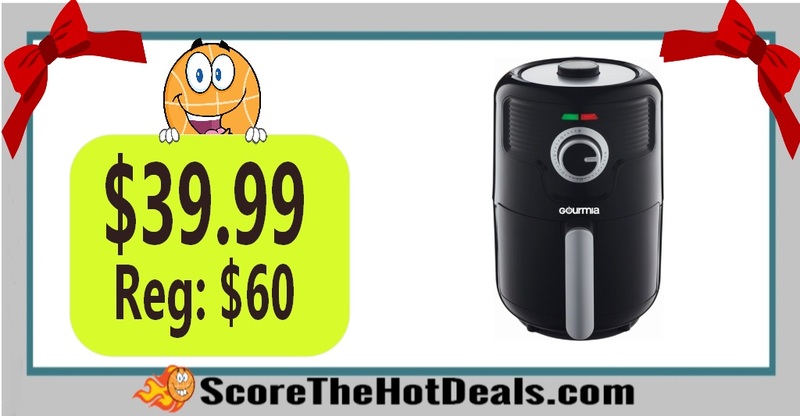 Gourmia 2.2Qt Hot Air Fryer – ONLY $39.99 SHIPPED! Hurry on over to Best Buy while supplies last and score a Gourmia 2.2Qt Hot Air Fryer for only $39.99! This is regularly $59.99 and shipping is FREE! Fry your favorite foods without adding oil by using this Gourmia air fryer. The 2.2-quart removable basket is great for everyday meals, and the intuitive LCD display lets you easily adjust the time and temperature for a variety of dishes. This Gourmia air fryer uses rapid air circulation to quickly and evenly heat foods. 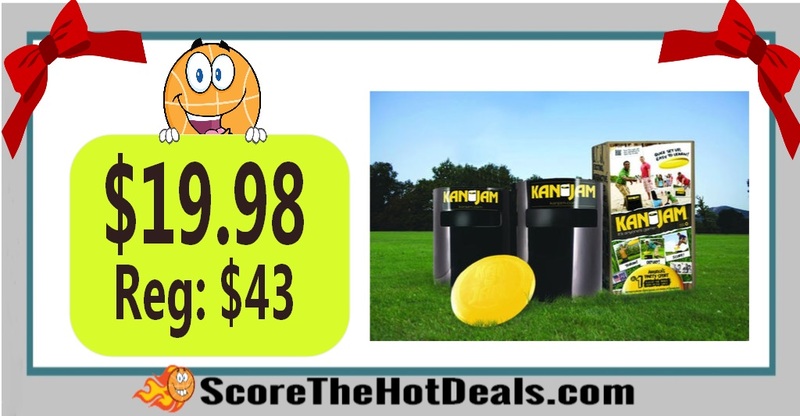 Kan Jam Game Set – ONLY $19.99! THIS IS A CRAZY GOOD PRICE! Hurry on over to ToysRUs while supplies last and score a Kan Jam Game Set for only $19.99! This is regularly $42.99 and shipping is free on orders over $29! Kan Jam is a disc throwing sport that is fast-paced, interactive and easy to learn. It’s the perfect game for backyard parties to beach blowouts and great for people of all ages. *HOT* Save up to 30% off + F.R.E.E Shipping – With Promo Code At CVS! Shut the front door! 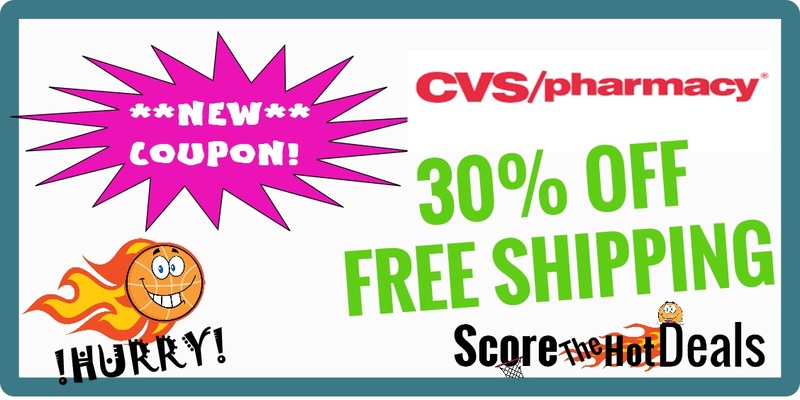 HURRY on over to CVS and score absolutely free shipping with no minimum PLUS up to 30% off with this crazy coupon! It could expire at any time, so hurry! Simply enter promotional code CVS30SHIP at checkout!! !